There's been very little sleep going on around here. Naveen is suffering from something called Hey listen, I'm entering toddlerhood, getting a mouthfull of teeth, and possibly having a growth spurt - so how fair would it be if you weren't miserable too? And Deaglan's been sleeping in our bed since he started school; let me tell you, he is not a cooperative bedfellow. All night long I'm fending off elbows and feet, not to mention scrounging for even a tiny scrap of sheet or blanket to cover myself with. So it was with great mercy that my husband let me sleep in this morning. He tiptoed the kids downstairs, fed and dressed them and headed out to the apple orchard. I hesitate to continue this little story, for fear you will shake your head with disgust. But I will go on because I feel it's my duty to illuminate how kind my husband has been today. When they returned from the orchard, Shaune headed outside with Deaglan to cut the lawn, while I put the baby down for a nap and showered. I quickly got dressed and drove to Winner's so I could find some fall clothes. And it just so happened to be one of those marvellous change rooms that didn't make me want to consider major reconstructive surgery so I bought a few things! And then Shaune made a wonderful meal of grilled pork chops with fresh apple chutney, roasted potatoes and salad. Now friends, before you roll your eyes, and click on out of here, I must tell you, he baked tonight too and because I feel downright selfish for having had this kind of a day, I wanted to share his easy apple turnover recipe with you. And just think, at least you can go away knowing that after I ate all of this, I likely don't fit into any of those tops I bought today anyway. 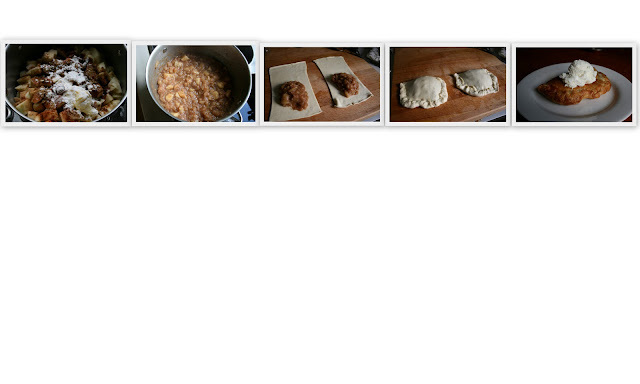 -Spoon on a mound of apple filling onto puff pastry (see collage below) leaving an inch around edges for folding. Refrigerate again until ready for the oven. -Once turnovers are sealed, brush with eggwash and sprinkle with sugar. If you're not watching your figure, which I'm clearly not, enjoy with some decent vanilla ice cream. Sounds like you had a wonderful day. Those apple turnovers sound divine. I must try those! Wait...what? Your husband cooks? Real food? That's edible? I'm sorry Kim, I'm just sort of shocked here. It might take a minute for me to recover. In the meantime...Winners! I remember that store. I used to hit it when I would visit Toronto. I really need to visit Toronto again soon. :) Glad you found some good stuff and have a lovely weekend. What a guy. You deserve and need one of these days. Glad you were able to enjoy it. I seem to almost always have a bed partner these days that has tiny feet and kids to kick. It does make for restless sleeping. I feel for you. My take on it - they won't be in the bed when they're 13 or 14 so it will pass in time. What a great day. Can you husband give mine some tips? Those turnovers do look delicious! Yummy! The Canadian took the boys to the park this weekend while I worked at home - 1st time ever. Wonder if something is in the cosmos for me right now?? You take those days and moments whenever you can get them! I'm pretty sure the turnovers were worth a little snugness in the tops too! That sounds amazing!! What a wonderful husband...and I'm sure you deserved a day of pampering!! You deserved this Kim! And it looks like Shaune had fun too:) I love picking apples in the fall, and they would taste incredibly good baked up into these apple turnovers. I plan to print this recipe and show it Amy. She will love making some!! Glad you are ok and back online, my dear. Big hug!! You have a good husband! and you deserve a break! I have been thinking about you lately...how one day you will be a famous author because I love love love your writing. Have you started on that book of yours? I know you will find success! I also know exactly what you mean about Naveen. Gracelyn is the same way right now. and Maddie has also been in my bed. Lots of rough sleep lately! What a heavenly hubbie you have. I love reading stories like these. And I could use some baked apples in my life. Scooping up the recipe. What a guy! Can't wait to try out that recipe..I will keep you posted how I make out. Does Shaun still have his website for his recipes? I wanted to grab the fabulous guacamole dip he makes? Shaune is a super guy! Love this post. Can't wait to try the recipe. The pictures are wonderful too.